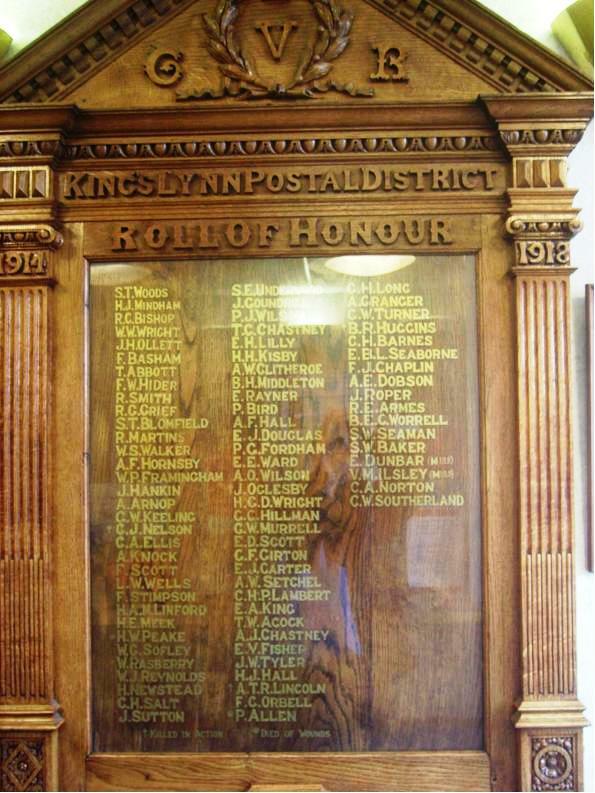 The King's Lynn Post Office Roll of Honour lists both those Post Office workers who served, and those killed, in World War 1. At some point in time it was put into storage in the Post Office and re-instated in 1980 (see Dedication details below). When the main Post Office in Baxter’s Plain was closed, it was moved to entrance of sorting office, Austin Fields. The Roll of Honour is housed in a glass case and this transcription was taken from the photograph which was taken with the case in place which has aused inevitable errors in transcription. The names here have been sorted into alphabetical order for ease of research and reading. Died of wounds - Lance Corporal 32034, 9th Battalion, Norfolk Regiment. Killed in action 29th April 1917. Born East Rudham, enlisted Norwich. Buried in ST. PATRICK'S CEMETERY, LOOS, Pas de Calais, France. Special memorial 12. Died of wounds - Private 21229, 6th Battalion, Border Regiment. Died of wounds 29th September 1916. Born Ilney All Saints, enlisted Norwich, resident Clenchwarton. Formerly 18099, Norfolk Regiment. Buried in CONTAY BRITISH CEMETERY, CONTAY, Somme, France. Plot I. Row E. Grave 21. A rededication service was held in 1980. The service of rededication pamphlet lists those attending the rededication.